I hate the “I’m sorry I haven’t updated my blog” posts, but I’d like to point out that I actually do have a really good excuse (Pictured at left). 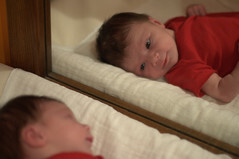 Anyway, my excuse loves to look at herself in the mirror while she’s being changed. I’m not sure what she thinks she’s looking at, because I don’t think she really has that self-awareness. But any time she’s awake, not eating, and not screaming, I’m happy, so at this point I don’t care. People keep telling me that the six week mark is where it all turns around and gets easier. We’re almost at three weeks. I have to say that, while I love my daughter and still can’t believe she’s real, the first few weeks of parenting are hard. I wasn’t really prepared for this. It’s cool, though. At least I have a photo subject that doesn’t (can’t) run away.